Gujarat Chief Minister Vijay Rupani on Thursday resigned along with his council of ministers, a day after Governor O P Kohli dissolved the legislative assembly following the recently-concluded polls, paving the way for formation of a new government. Rupani, accompanied by Deputy Chief Minister Nitin Patel and other ministers visited Raj Bhavan in Gandhinagar and handed over their resignation letters to the governor. "Chief Minister Vijay Rupani and his entire council of ministers have tendered their resignations to Governor O P Kohli who has accepted them," Patel told reporters outside Raj Bhavan. In the recently concluded polls, the Bharatiya Janata Party retained power by winning 99 seats in the 182-member assembly while the Congress claimed 77. Six seats went to others, including three Independents. Meanwhile, Patel said a meeting of all the newly-elected BJP MLAs would be convened soon by state BJP unit president Jitu Vaghani to select the next chief minister. However, he refused to assign any timeline for the meeting and formation of the next government. He said the entire process to select the next chief minister will be carried out under the supervision of Union Finance Minister Arun Jaitley and BJP general secretary Saroj Pandey who have been appointed as observers by the central leadership. "Since Parliament is in session, the party (leadership) will inform us in one or two days as to when Arun Jaitley ji and Saroj Pandey ji would come here. In their presence, MLAs would take a decision about the new chief minister," Patel added. Though speculation is doing rounds on who will be the next chief minister, mild-mannered Rupani seems to be a front-runner and is likely to retain the job. 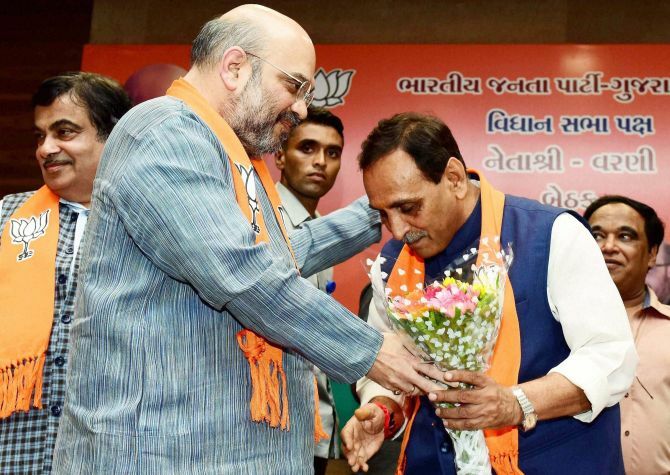 Sources in the BJP had said the party was likely to stick with Rupani. BJP president Amit Shah had said during the campaign that the party was fighting the election under Rupani and Nitin Patel. Sources had said the central leadership may also think of changing the chief minister following the narrow win of the BJP. Besides Rupani, the other names doing the rounds for the top job in the state are those of Nitin Patel and Mansukh Mandavia, a Rayja Sabha member from Gujarat who is a member of the Narendra Modi government. Mandavia is from the Patidar community. Earlier, Rupani had said the party's parliamentary board will take the final decision. December 25 is the likely date for the swearing-in of the new ministry as it is the birthday of former prime minister and BJP stalwart Atal Bihari Vajpayee, the sources had said. The BJP, which returned to power in Himachal Pradesh with a thumping majority, may pick one of its MLAs as the state's new chief minister, with five-time MLA Jairam Thakur being seen as a front-runner, according to indications on Thursday. Union ministers Nirmala Sitharaman and Narendra Singh Tomar, who are BJP's central observers, reached Shimla on Thursday to hold consultations with the newly elected party MLAs to elicit their views and arrive at consensus on the name of a new chief minister. A senior BJP leader said on the condition of anonymity that there is a strong view in the party to pick one of the elected MLAs to head the government in the hill state. The name of the new leader is likely to be announced on Friday. Both Sitharaman and Tomar met the party's state unit core committee, which includes Dhumal, state party chief Satpal Singh Satti, all the five MPs from the state and organisation secretary Pawan Rana. The central observers who arrived in Shimla late in the afternoon addressed the workers at Peterhoff before meeting with the core group. The observers will hold more consultations as a large number of MLAs are yet to arrive. The party won 44 seats in the 68-member assembly. The clamour for making Dhumal the chief minister has also gained momentum and three BJP MLAs have reportedly offered to vacate their seats for him. Will Vijay Rupani keep his job after a close fight?